I felt your gasp and shaming eye as you read that title. Well, guess what? None of those are true. -If I lived on Doritos, yes I would be unhealthy. -If I never got out of bed, yes I would probably be unhealthy. -If I ate Doritos ONLY in bed, there might be something to say for this. -AND if I acted like I was a robot who never ate minimally nutritious foods, I would be doing my clients a disservice. I am a real person and I teach women how to be healthy while navigating REAL life and being a REAL person. The reason you feel the need to shame me is because of how you’ve been programed to view food. Our society is very black and white with food-this causes food shaming. People getting all ‘hoity toity’ and ‘better than thou’ about their food choices. You aren’t a better person than anyone else because of what you choose to nourish your body with. And another person isn’t better than you. Everyone just needs to get over themselves and realize this is causing serious problems-which we will get to in a minute. And remember, if someone is food shaming you, it’s because they have their own hang-ups around food. Guess what? I love Doritos! Not all of them…just the Sweet Spicy Chili. I don’t ever eat the other ones because they aren’t as good to me. If I’m going to indulge in something, it’s going to be something I really like. I am very well aware of what I am doing when I’m eating them…I’m enjoying them and CHOOSING to eat them because they make me happy. Eating them in bed just makes the enjoyment that much better. This Doesn’t Mean I Wasn’t Healthy the Rest of the Day or that This is Me ‘Throwing in the Towel’ in Any Way. Just because I ate Doritos in bed doesn’t mean I didn’t live on vegetables, protein, and more nutritious foods the rest of the day, that I didn’t strength train or walk that day. I did all of those things. I just wanted some damn Doritos! Stop letting people food shame you or act like you have to be so black and white with your eating. Meaning some foods are more nutritious than others. So, you might want to live on certain foods and not on others. But, it doesn’t mean that any food can’t be enjoyed at a certain time. And be enjoyed any way you want it. If eating a Snickers in the hot tub is up your alley, then do that! Again, I just wouldn’t do it every day. This mindset of labeling things ‘good and bad’ is what gets us into trouble and creates disordered eating patterns long-term. It creates a mindset of perfectionism. And since perfectionism doesn’t exist well in real life, this causes a lot of people to throw in the towel. The thing you thought was ‘throwing in the towel’ is actually an act that’s preventing you from doing so in the long-run. Okay! Well, I am off to workout now- since I can eat Doritos and workout in the same day. 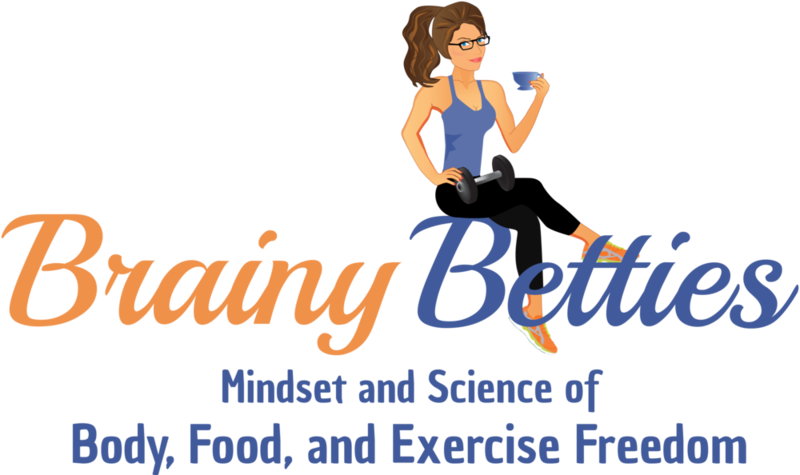 Get the Brainy Blog in your inbox so you can be Fit AND Happy!